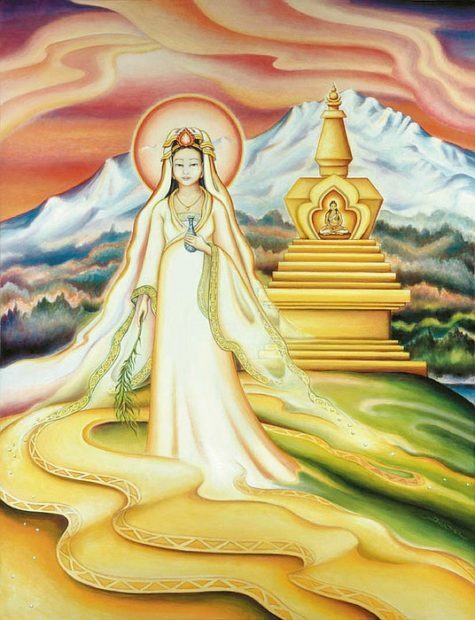 Kwan Yin is the very essence of mercy and compassion; among the most beloved and well known of all spirits. 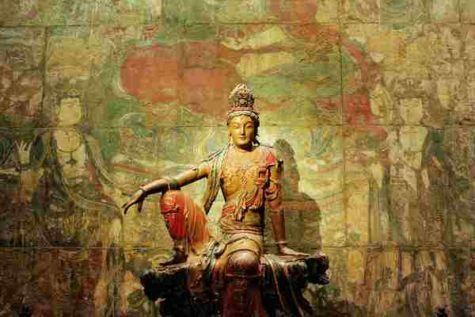 Technically, Kwan Yin is considered a Bodhisattva, venerated as such throughout the Buddhist world but she also possesses the stature of a goddess and many consider her to be one, not just modern Western goddess devotees but also in East Asian folk religion. Kwan Yin is a spiritual phenomenon; she transcends religious boundaries and is also found in Taoist and Shinto shrines, even in the shrine of her main rival, the Lady of T’ai Shan. Kwan Yin is a great favorite of independent practitioners and goddess devotees everywhere. Kwan Yin protects the helpless, particularly women, children and animals. She bestows good health and fertility. She guides and protects travelers especially seafarers and sky travelers. In recent years, Kwan yin has emerged as the guardian of air travel. She protects against attack from either animals or humans. She breaks cycles of rebirth, punishment and retribution. Kwan Yin provides protection in the realms of the living, the dead and anywhere else. Kwan Yin’s true identity is subject to debate. 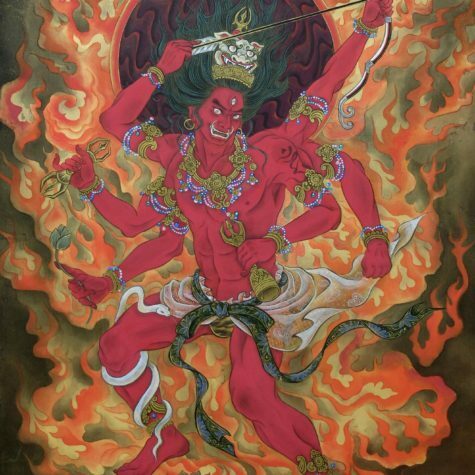 Officially she is an aspect of the Bodhisatva Avalokiteshvara. 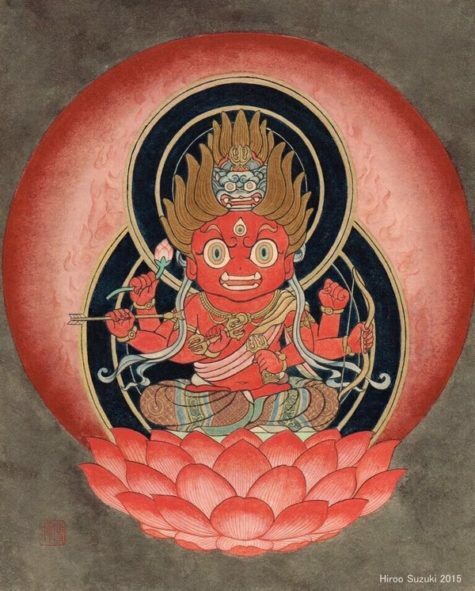 The Lotus Sutra, which describes Avalokiteshvara, was among the first Buddhist texts translated into Chinese. 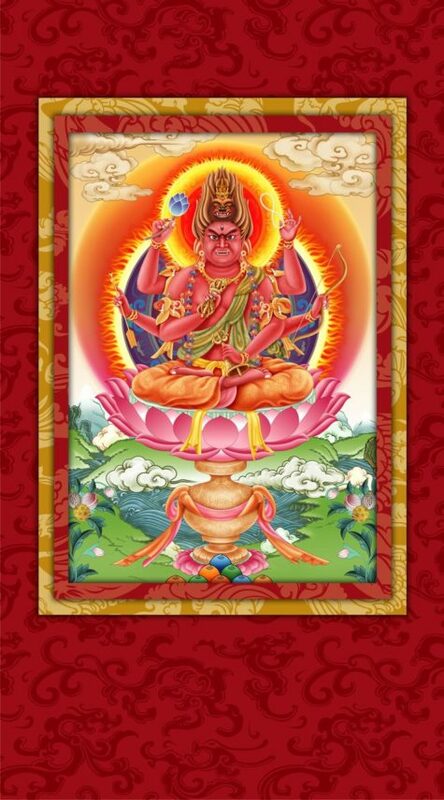 Avalokiteshvara translated into Chinese is Kwan Shih Yin. The first Chinese statues of Kwan Shih Yin aka Avalokiteshvara, appeared in the 5th century CE and depict him as a slight, graceful, androgynous man. Kwan Yin as we know her today first emerged from China’s wild northwest frontier, by the Silk Road, sometime between the 7th and 9th centuries CE and began to move into the Chinese heartland during the 9th and 10th centuries along with detailed legends of her life, which do not correspond to Avalokiteshvara but to the Taoist goddess, Miao Shan. 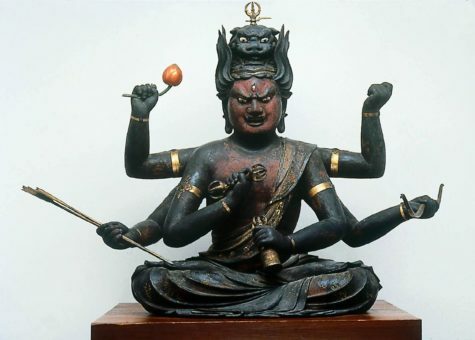 Kwan Yin may really be Miao Shan assuming the official guise of Avalokiteshvara as Buddhism was then socially dominant while Taoism was disparagingly considered folk religion. Her strong identification with horses may also indicate her origins on the western frontier. Alternatively, many believe Isis, Mary Magdalen, and/or Mary, Mother of Christ traveled the length of the Silk Road, finally emerging as Kwan Yin or that their images may have served as a portal for a frontier spirit. Whoever she is, she is entirely good. The desire of so many individuals and traditions to claim Kwan Yin testifies to her appeal and power. Women, children, exiles and travelers but Kwan Yin vows to respond to anyone who calls out her hame in his or her moment of fear or suffering. She offers aid, mercy and compassion to anyone who suffers. She helps not because of who you are, but because of who she is. Kwan Yin has many forms. She is typically depicted as a kind, beautiful woman dressed in white. In her fertility goddess path, she carries at least one child. These statues closely resemble images of Isis or the Madonna. Kwan Yin is depicted with one-thousand eyes and one thousand arms indicating her ability to see all and help all. Kwan Yin may be accompanied by her acolytes, a small girl and boy. However, Kwan Yin is a goddess of the masses. Not everyone can afford a statue, and so Kwan Yin’s name or even her title, the Goddess of Mercy, written on a piece of paper and posted where it is visible is considered just as powerful and effective as an image. 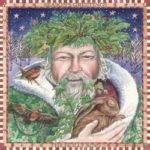 Sacred days: The first and 15 of each lunar month, the New Moon, and the Full moon. 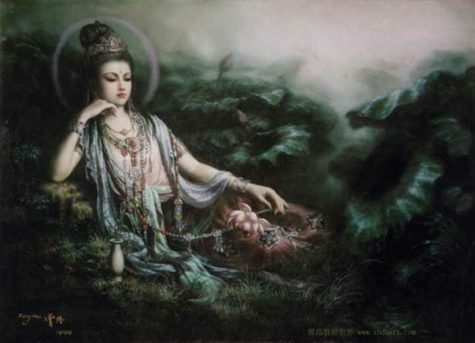 Feast days: The 19th day of the 2nd Chinese month is Kwan Yin’s birthday. The 19th day of the 6th Chinese month commemorates when Kwan Yin became a Buddha. The 19th day of the 9th Chinese month, the day she first wore her sacred pearls. Offerings: Oranges, pomegranates, spices, incense; Iron Goddess Oolong tea; offerings on behalf of needy women, children, and wildlife. Note: Kwan Yin is a vegetarian. Her image on restaurant menus often indicates that vegetarian fare is served. Give appropriate offerings (i.e. don’t give her steak). Many devotees adopt a vegetarian diet in her honor but even those who do not, traditionally eat vegetarian on her sacred days. 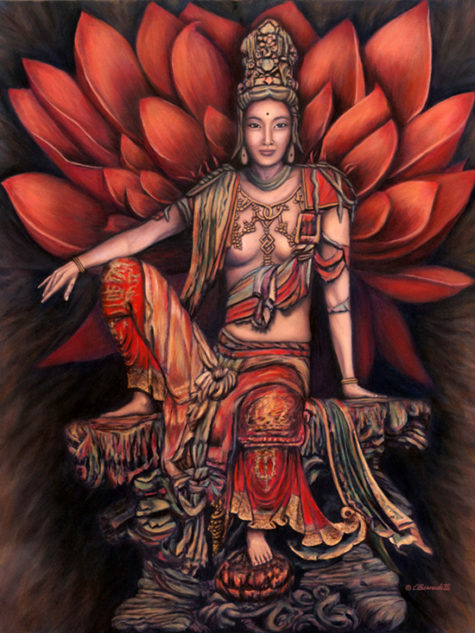 Kwan Yin epitomizes goodness. No one is kinder, more compassionate or more benevolent. Kwan Yin doesn’t possess a single malevolent or malicious impulse. She is also exceptionally responsive, as evidenced by her world-wide veneration. If you are new to spirits or are generally afraid of them, Kwan Yin may be the right spirit for you.